Once again, some Sunday evening thoughts. 1. 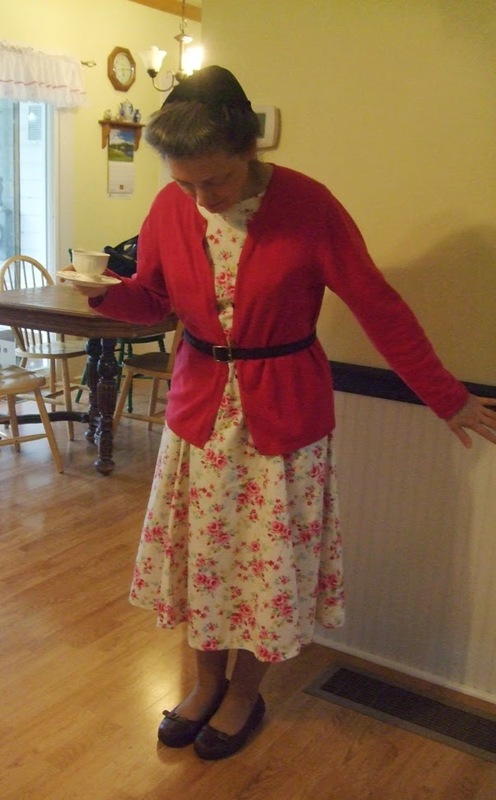 I sewed a new dress for the Valentines dinner the church youth group put on. It was a vintagey cotton print that I bought in Thailand and I thought it looked Valentinesy as well. After I posted a picture on Facebook, someone asked for particulars on the dress. So today I posed in it, after Jenny yanked and adjusted. She also said, "Now pose like a fashion blogger." "Hmmm. What would Shelley do?" So I did this, and you can now set your mind at ease if you feared that I was going into fashion blogging any time soon. But it was fun. And the dress was fun to make and wear. It's a very basic princess-seamed, no-waist dress. So it looks better with a belt. Jenny said, "It's cute. I would actually wear something like that." I was amazed, as we had a little. . . um. . .fight. . . tempest in a teapot. . . tiff. . . spat?? about that very subject this week. She is playing volleyball on the school team and is thoroughly dedicated to improving herself, from "running lines" as her coach orders to doing the exercises Steven tells her to do to pinning volleyball pointers on Pinterest. And she needed new volleyball shoes. We went through this with Steven too, back in the day, when he "needed" a different pair of athletic shoes for basketball, running, football, practice, the high jump, and a youth group softball game. But she finally convinced me so, ok, fine, if she'd pay for part of them. And we found a cute pair on PayLess.com. Not long after, my old garage-sale tennis shoes were not only flopping at the sole but painfully pinching my second toe. So I also went to PayLess and looked for a pair of shoes that came in 8-wide and weren't zebra striped or hot pink. I showed Jenny what I ordered. They were exactly like hers. The horror, People. The travesty. The violation of all proper boundaries. And the complete mystification on my part. I still don't know if it was because they were no longer unique, or because it was her mom who would have a pair like hers. The next day, we loved each other again and worked out a solution that involved me exchanging the shoes but her doing the work involved. And then today she says she'd wear a dress like mine. There is much I don't understand, but I feel flattered. A bit fragile as well, but still flattered. 2. Steven was just accepted into the firefighter program at Chemeketa Community College in Salem. I think it's a two-year course. Which means that every one of our kids is in some form of school. Emily is at the U of O [regon not hio or klahoma] studying communications. Ben is at OSU [Oregon again] studying engineering. Steven will soon be at Chemeketa. And Jenny is in high school. Which leaves me, feeling just a bit left out. 3. A mean cat showed up this evening and attacked Raven, the black kitty that Steven rescued from the warehouse and who still has "nervous abused child" written all over her face despite the love and food it's gotten since, and the snuggling in the sunshine with the other cats. The three other cats, who have been doted on since babyhood, and who have security, laziness, entitlement, and languid self-confidence written all over their faces--they were left alone. Which made us wonder. You know how human predators pick on the abused and insecure, even long after the abuse is past? It's infuriating. Do cats--or maybe all mammals--have that same terrible instinct for picking out an easy victim, and making those who have already suffered too much suffer still more? Emily brought Raven inside, because we all need to protect the ones who aren't strong enough to protect themselves. 4. This morning at 7:00 I talked to Amy on Skype, that magic program that lets you sit in your office in your jammies and see your daughter in Thailand with your own eyes. Yes, she looks happy, and not too thin, and her bruises from her bike mishap are healing. And then your mom-soul feels full and satisfied and you thank God fervently. Mir sehne nanner nieme mehr. "Now friends, don't cry so much. We won't see each other again." Which is kind of contradictory if you ask me. Terrible words, really. Imagine how poor and miserable you'd have to be to uproot and take off in a gamble for a better life, knowing you'd never see your friends and family again. Meanwhile, I really like Skype. 5. I've never understood people who are horrified and distraught when someone leaves their church and goes to a different one. I mean, yes, you miss people who leave. And sometimes their life trajectory makes you nervous. But. Churches have personalities and just as not everyone would want to be married to a bookish introvert or a back-slapping basketball player, not everyone fits in well at one particular congregation. The important thing is that they find a solid, Jesus-loving church that works for them, and get involved. I have heard all about Leaving For All the Wrong Reasons and Going Down the Liberal Road and My Daughter Who Left Because She Didn't Want Anyone Telling Her What to Do. Certainly there are times to be upset. I remember attending a church where it was pretty much a sin to leave. It was almost like escaping a cult, where if you didn't want to be brought before the elders and reduced to shame and tears, you had to sneak off in the night, just about. Why would anyone stay there for any reason besides fear, which is a terrible basis for church membership? I think if people know they are free to leave, they will feel more free to stay. Emily: So I've just had this conundrum all day. Is Pi Day really at 9:26, since it's Daylight Savings Time? I mean, should it be 8:26 or something since we're on fake time? Ben: It's not a celestial event! It's entirely man-made! Three weeks ago I met the maintenance man. He assured me he wasn’t pregnant. We “Smucker ladies,” a group of five sisters and in-laws, get together for coffee once a month. At our January meeting, my husband’s sister Lois divulged that her daughter Lisa, married last year, hadn’t been to the doctor yet but she thinks she’s pregnant. Of course we all clucked like happy hens at this news. My phone automatically signs my name after all messages. A pause followed in which I suddenly recalled that Lisa had moved to Michigan when she got married, and maybe she had — oh dear, please, no — changed her phone number. Horrified, I texted the unfortunate unknown. I realize now that this moment was where the story tilted, the setting expanded, and the window opened to further possibilities. I could have closed the book then, and it would have remained a slightly embarrassing episode that I related, at most, to my family after school. Instead, I turned the page and let the story keep happening, sharing the text conversation on my Facebook page where hundreds of people would read it and, I hoped, chuckle quietly and give themselves grace for their own mistakes. A woman named Elizabeth had contacted me via Facebook regarding an upcoming talk at Garden Way Retirement Community. A few hours after I posted about the texts, another message from Elizabeth popped up. She wondered if I had filled out the W-9 form. Yes, I had, I told her, and then I went to finish the dishes. I phoned immediately. What in the world? She had just finished her Facebook conversation with me, then decided to read my page and see what was happening in my life. She read the post about the mis-sent message and started laughing. The activities director across the hall wondered what was so funny. The universe tilted sideways, goose bumps bristled up my arms, and my mouth tried to say something but couldn’t. It was impossible, that’s all I could comprehend. And yet it had happened. “Unreal!” we both said. “How in the world?” Then, laughing, I asked what sort of person this maintenance man was. She kept her word. Brian the maintenance man was gracious and good-humored. No, he was not pregnant, and yes, he had recently changed his phone number. He wanted to know the niece’s name, in case he gets more messages for her. We took a photo — me, Elizabeth, Brian and Brenda the young activities director who had wondered what was so funny. “These things just happen to you,” a friend told me later, implying that I operate on a different plane of possibility than the rest of the world. “Stories happen to those who tell them,” my mentor, Jessica Maxwell, used to say, as though the crazy collisions of time and events seek out and select only those willing to interpret them afterwards. “What are the chances?” I asked my engineer son, wondering if one can quantify the impossible. No engineer can quantify vulnerability, I decided, or the infinite difference between being open to the unexpected vs. being locked in fear of events that you didn’t choose ahead of time. How many happy endings would never have been written if we all insisted on the explainable and manageable, how much success avoided, how many romances never sprouted? Such as, for instance, the case of the couple who met at Walmart. I first heard of them two years ago, at a family dinner, from my husband’s aunts, who introduce stories by yanking one sentence from the end and a few from the middle. 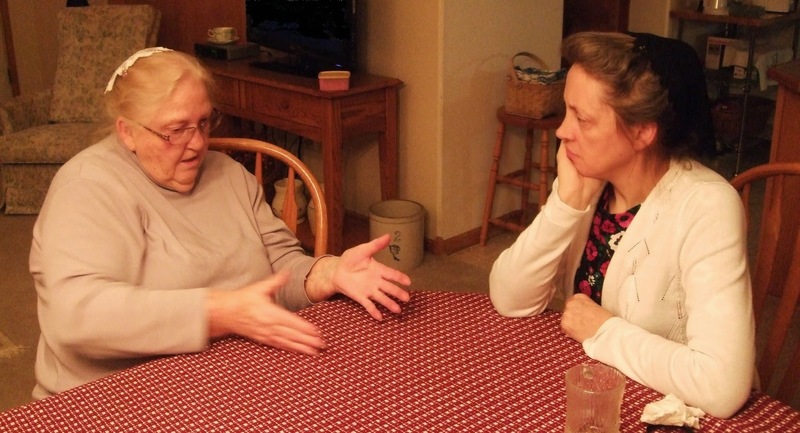 Eventually, we pieced the story together, between two emphatic aunts injecting random bits of information. She turned out to be Sara June, my husband’s Uncle James’ children’s aunt who had been widowed for a number of years. She was going on a normal shopping trip. He was a good man from proper Mennonite stock, but she had no way of knowing that when she kept running into him at Walmart that day, or that his wife had died a year before, or that before he left the house that day he prayed he’d meet someone. They kept meeting up in one aisle after another, and finally at about the third meeting she said, “Do I know you?” and they started talking. Eventually, they were engaged to be married. I loved this story and wrote about it on my blog. In another odd twist, I met this same couple at the Kansas City airport just recently. She showed up in front of me at Gate 45 as I waited for my flight to Portland. 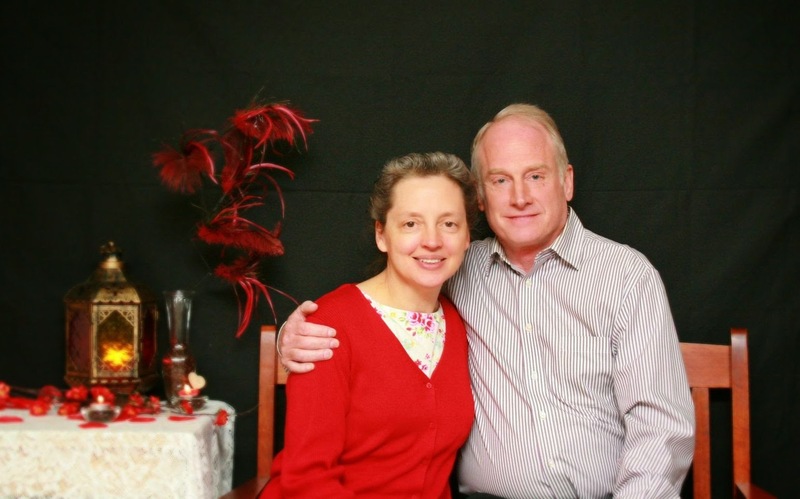 She introduced me to her husband, who told me about that meeting at Walmart, how beautiful she looked that day and how God must have meant it to be. He still looked surprised. You can’t plan serendipity, that mysterious wind that the dictionary defines as good fortune, luck, and an aptitude for making desirable discoveries by accident. But you can choose to leave the safety of carefully chosen circumstances and take the risk, open the windows, turn the page, and step around the corner to that slightly curving universe where the hilarious and impossible are waiting for you to appear. I feel sorry for any woman who doesn't have sisters and aunts. My last post was on February 12, I see. Usually, there's an inverse relationship between the level of activity in my life and the number of blog posts happening--more of one means less of the other, you know. A month ago Paul and I went to the BMA Ministers' Weekend in Virginia, conveniently close to my sister Rebecca's, then Rebecca and I drove to Pennsylvania for two days with our younger sister Margaret. The last two times we were together were Mom's funeral and Dad's sale, both times of unbelievable stress, hard work, and cooking for 20 people. Of course, we had our moments of collapse-at-the-knees laughter in the middle of all that. But most of it was the sort of stress that makes you shudder at the memories. But this time we had two days together, and we could just have fun. So we did. We shopped at Amish stores. We got massages. We talked deep, we talked shallow, we laughed, we remembered. Did I mention that we laughed? 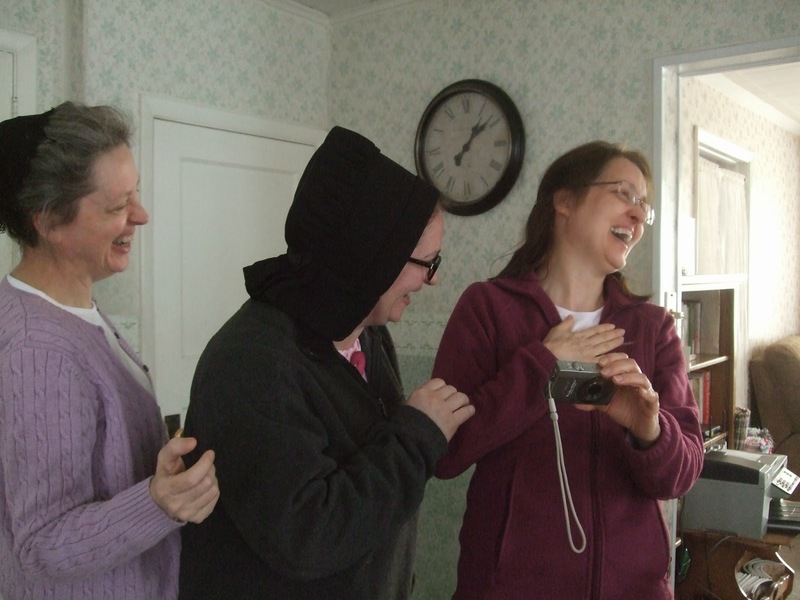 Here's me, Margaret in Grandma's old bonnet, and Rebecca showing us what we look like on her camera. Sisters just GET you. They understand asthma, husbands, sons with Those Yoder Genes, and obsessions--with fabric, with bargains, with needing to talk about those awful times one more time. They were there and they know what you went through. They know how much it hurt to have babies and they never never say horrible things like, "Well, it wasn't PAINFUL for me exactly, more like a lot of pressure," like other women do. Sisters eat cookie dough straight from the bowl and they like purple and warm sweaters and they don't look at you with a blank look when you pull an obscure quote from The Biggest Bear. This past weekend I spoke at a ladies' retreat in Illinois, then we [Paul and I] drove to Iowa and spent two days with my aunt Vina, Mom's only sister, who was ten years younger than Mom but probably her closest friend and confidante. I wanted to know what they were really like as sisters. Not only as a mom and aunt sharing secrets in low tones as they peeled potatoes together, but sisters, and why Mom told Vina things she never told anyone else in the world, and how they could be so alike and yet so different. The long talks filled a thirsty part of my soul, it was like a little taste of Mom again, articulate and observant and so very funny, but yet not Mom of course, but an aunt who was just as wise and interested in me and honest as an aunt ought to be. Of course most of the stories are not for the world to hear. I write this on the plane, flying home, and I am itching to pick up the phone and call my sisters and tell them everything, in every detail, giggling like silly town girls* or wiping tears, because that is what you do with sisters.